Before this race, Mark Cavendish had never actually beaten Marcel Kittel when the two have gone head-to-head in a sprint. That stat is old and irrelevant. He’s now beaten him three times in a week in the biggest race of all. Not bad for someone who’s habitually a slow starter. Where once Cavendish had a sprint train – a great queue of team-mates ahead of him forcing the pace and peeling off – he is now more of a trailer or caravan. He has a couple of assistants who keep him there or thereabouts in the run-in as the pace picks up, and then his longtime pilotfish Mark Renshaw tries to drop him off behind whichever of the favourites he thinks is the best bet for the finish. Sounds simple, but it isn’t, although they’re making it look like it is. The win – and the larger haul of points for winning a sprint finish in this year’s Tour – means Cavendish is also back in the green jersey. You may well not have heard of Dan McLay who came third. The young New Zealand-born Leicester man increasingly seems like one to watch. I highlighted a spectacular piece of astonishingly woeful positioning earlier this season and in yesterday’s stage he finished the day bearing down on Cavendish and Kittel at speed, which is certainly an eye-catching thing to be able to do. Okay, it’s business time now. 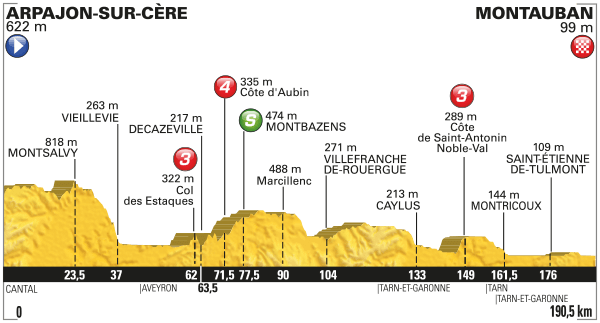 This is the first of three Pyreneean stages on the bounce which will shape the general classification for the rest of the race. With a five minute advantage, Greg Van Avermaet might retain his attire today, but he’ll be back in BMC colours by the rest day on Monday. 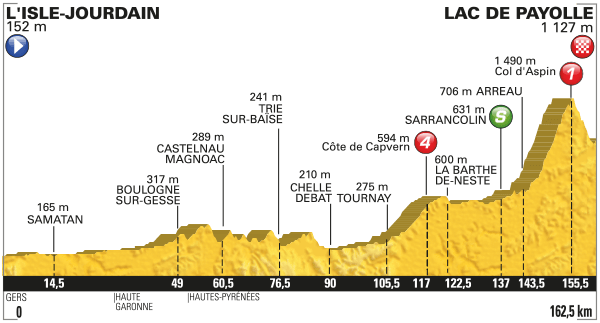 The climb is a fairly normal Tour de France climb: long and not insanely steep. The subsequent descent is a bit tricky, so one of the favourites could potentially attack over the top, if they’re willing. Stage-wise, a breakaway win is reasonably likely. Specialities of this region include the morally-objectionable foie gras and the morally-neutral crusty apple pie.